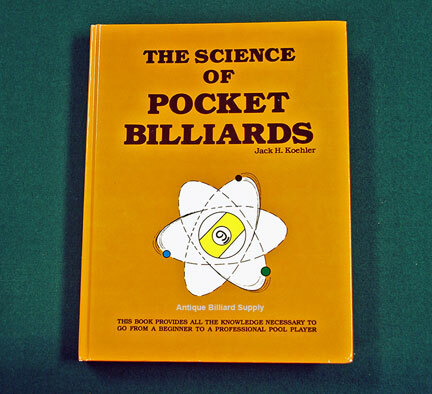 #12-16 "The Science of Pocket Billiards" by Jack Koehler. Covers everything from basics to the most advanced concepts of pool. Includes 33 photographs and 277 illustrations to help clarify the material presented. The occasional player can skim through the book and learn enough for a lifetime of casual play while a serious student of pool can study this book for months or even years and continue to gain valuable knowledge. 262 pages, about 8.5 inches wide, 11 inches tall. Hardcover edition signed by the author $45.